My podcast is produced through Tin Can Media, and my producers run a show called Kettle Of Fish, where they have all sorts of amazing people on. 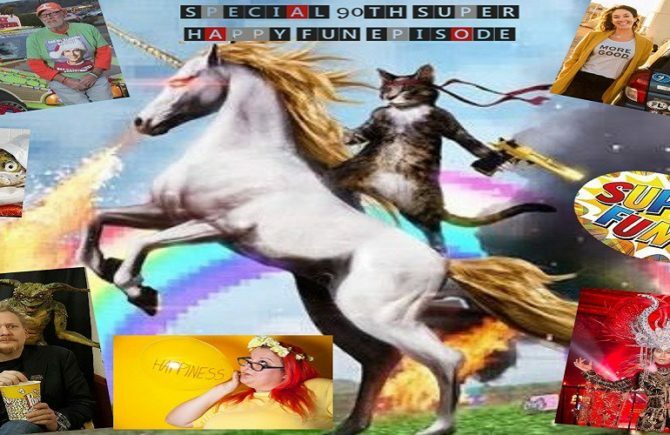 This Sunday, the theme was “super happy fun” and I had the opportunity to co-host with Nick and talk to a bunch of people who spread happiness, joy, and beauty in the world in all sorts of different ways. It’s a pretty incredible episode, and if you need a mood boost or a reminder that the world is full of good people, this is the podcast for you! Coach Moore – A retired football coach who drives an incredible art car and started Care365 and believes the world thrives on genuine caring and lives his life based on that principle. Mary Latham – A babe who started the GrAttitude Project and then More Good Today, a project where she’s driving to each of the 50 states to collect stories of kindness. Bobby Love – An incredible fashion designer at Happy Place Designs whose pieces will take you to a place of fantasy, yet this is just his hobby. Shad Nowicki – A colorful artist who makes wonderfully unique pieces inspired by pop culture, comics, and more and the more part is that he really goes the extra mile with each piece of art.